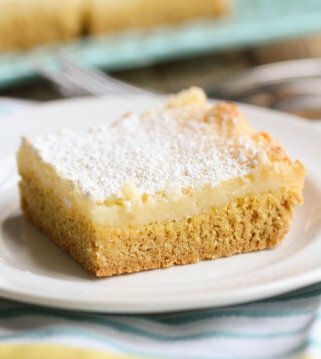 Everything you love about Boston cream donuts and pies, in the form of a cool and creamy pudding poke cake! This Boston Cream Poke Cake has a texture and taste that is nothing short of dreamy. Best of all, it’s made entirely from box mixes – EASY!! 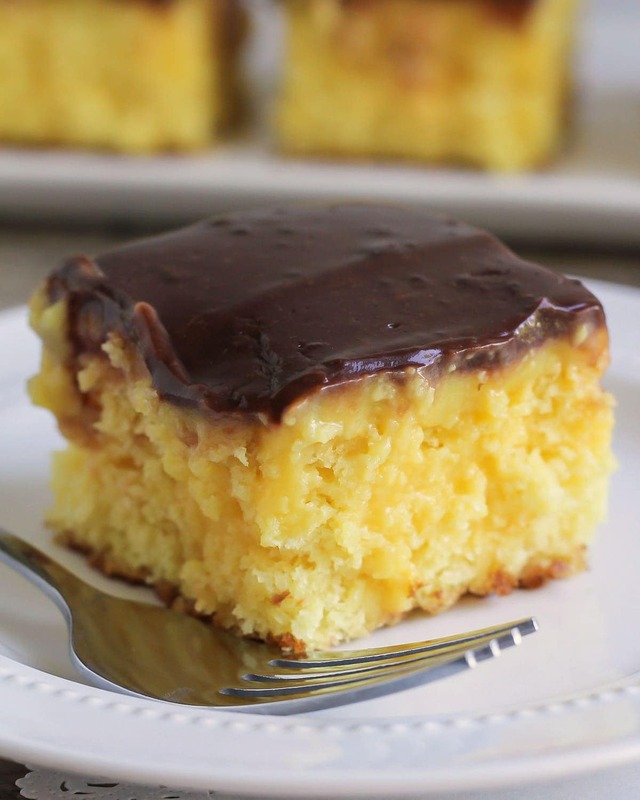 This Boston Cream Poke Cake recipe was actually suggested by my husband, whose favorite donut happens to be a Boston Cream donut (it’s my favorite too!). The Boston Cream donut was actually created after the famous Boston cream pie, which isn’t a pie at all, but a cake! 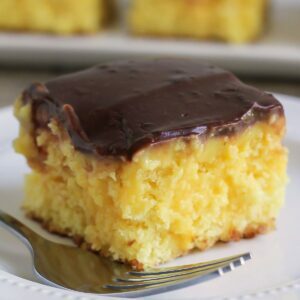 The rich, classic dessert consists of a vanilla custard sandwiched between two yellow cake layers, and topped with a chocolate ganache or frosting. Make cake as directed in a 9×13 pan. While the cake is still slightly warm, use the end of a large wooden spoon and poke several holes into the cake. Make French Vanilla pudding as directed. Wait a minute for it to thicken up a little more and pour over cake, making sure it fills all the holes. Make Chocolate pudding as directed. Pour over the cake and the layer of vanilla pudding, using it as a frosting or ganache. TIP: This step may be easier if you refrigerate the cake for a little while after pouring the first layer of pudding. Refrigerate at least 30 minutes to let all the pudding set, and serve cold. ENJOY! It really is that simple! And like I said, it tastes just like a Boston Cream donut, but in the form of a moist, creamy cake. Poking the holes in the cake allows the pudding to seep into the cake and give it a really nice consistency. That’s what makes poke cakes SO delicious! Everything you love about Boston cream donuts and pies, in the form of a cool and creamy pudding poke cake! This Boston Cream Poke Cake has a texture and taste that is nothing short of dreamy. Best of all, it's made entirely from box mixes - EASY!! Make cake as directed in a 9x13 pan. Poke holes into cake using the end of a large wooden spoon while cake is still semi-warm. Make French Vanilla pudding as directed. Wait a minute for it to thicken up a little more and pour over cake, making sure it fills the holes. Make Chocolate pudding as directed. Pour over cake as well. Refrigerate for at least 30 minutes and serve cold. Pictures for this recipe were re-taken by Alicia of The Baker Upstairs. YOU are VERY BAD for my WAISTLINE! this recipe sounds divine & is definitely being tucked away for future use. YUMMO! BRILLIANT!! I love boston cream pie. 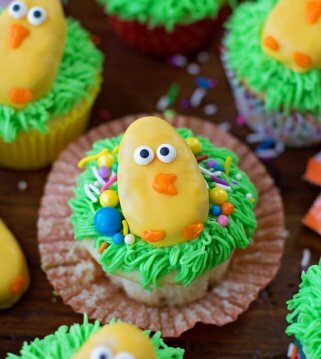 I can not wait to make this! that sounds amazing, had to pin it! This pregnant momma really wants to make this…. This was so great! 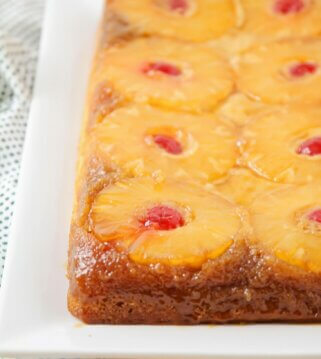 Took it to my in-laws for dessert and it was a huge hit, and so easy! 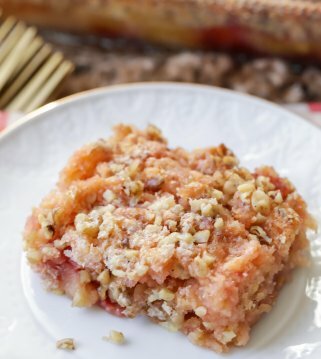 It will definitely be my new go-to for potlucks and easy desserts. And even better the next day! Thanks so much for sharing! I am going to make this for my mother in law’s birthday tonight :] I am assuming you don’t put the instant pudding in the fridge like the directions say. You just prepare it and let it thicken a little and then pour it over? Sorry – just saw this… and yes, pour it over after you’ve made it and stirred it for a minute or two. How did it turn out? Did she like it? I am making this as I type! All my favorite ingredients!! It’s gotta be good! Thanks for sharing! This was SUPER Easy! Wonderfully light and Oh SO moist! My family loves it and after just making it last night, (I’m talking 9p.m.) It’s about 3/4 gone! This is something I will gladly make again, and again!! Thanks Lil Luna! I’m bookmarking your blog!! This looks great – I’m going to try it tonight, and if it is as yummy as it looks, I’m going to make it for our mission trip (50 high school kids – last year I made ACTUAL boston cream pies, which took a long time and were pretty messy). Found your recipe through pinterest – I just wanted to make a quick comment to show my appreciation. I made this yesterday for a fourth of july barbecue and it was perfect – cool, moist and tasty! Thank you for sharing! Hi! This sounds perfect for my husband’s birthday! Just 2 questions, how deep do you poke the holes and how far apart do you poke the holes? And you leave it in the pan, right? Thanks! Hi Jessica! Yes, I leave it in the pan and poke the holes like an inch deep about an inch apart. Does that help? So happy I came across this, I am not a fan of boston creme, (although this sounds delicious I will have to try it) but my hubby is. Can’t wait to surprise him with this cake for his birthday! can this be done with regular vanilla pudding? did you use instant or cooked pudding? 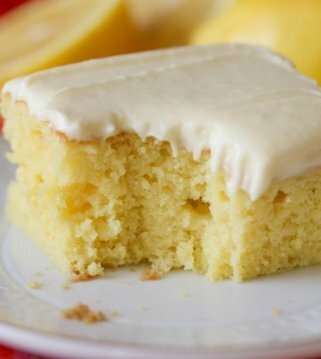 I pinned this a couple weeks ago and just went to make it…the recipe is no longer showing. Help!! The puddings used are “instant” not “cook and serve” right? Will the pudding seep into the holes like gelatin or will it need some “help”? 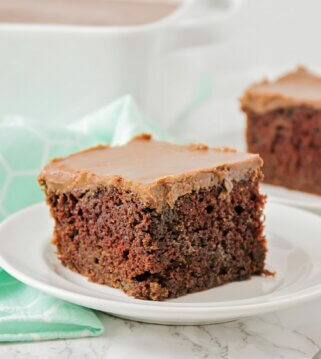 Have you ever used just chocolate frosting or a different topping for this cake? Let me know what you would recommend other than choco pudding. Thanks and love ALL your recipes! I use instant 🙂 And, yes, it does seep in. I have not tried a different topping, though I like to experiment, so I will have to see what else would work. Thank you so much! You are adorable and I love your recipes. You are appreciated, thank you. 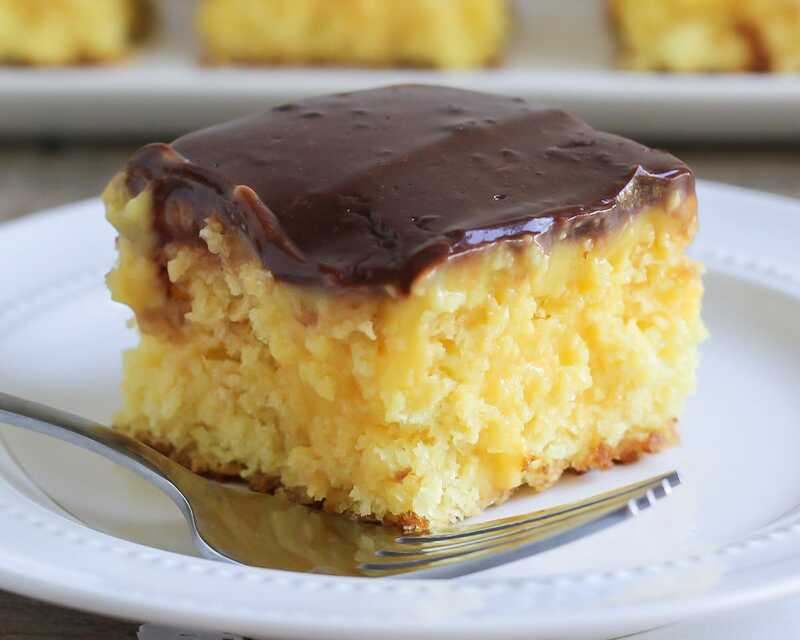 On the Boston Cream Poke Cake are you using Instant pudding or cooked pudding. This sounds like a wonderful cake.